Print your 3D model in flamingo with the NinjaTek NinjaFlex 1.75mm 85A TPU Flexible Filament. With a shore hardness of 85A, this thermoplastic polyurethane (TPU) flexible filament has 68% better abrasion resistance than PLA and 20% better abrasion resistance than ABS. 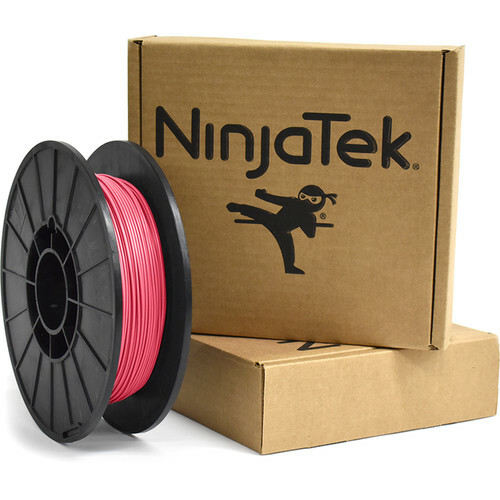 Designed to be flexible, this filament features up to 660% elongation, which allows for repeated movement and impact without wear or cracking. The composition can also help reduce vibration. This filament doesn't need glue or tape when printing on a standard print bed. It is also resistant to many chemicals, such as naphtha, ASTM oils #1-3, petroleum, and freon. Box Dimensions (LxWxH) 9.35 x 9.05 x 2.4"